L.A. 1984; the artist Sophie Calle approaches random strangers on the street and asked them each the question: "Since Lose Angeles is literally the city of the angels, where are the angels?" Their answers brought her variously to a liquor store, a man's house, a Baptist church. Each person she questioned interpreted her differently, and each had their own conception of what an angel is and how it relates to their city. The variety of answers reveals the identity of a city as not just made from geographical or administrative systems, but from embodied experiences and personal histories as well. 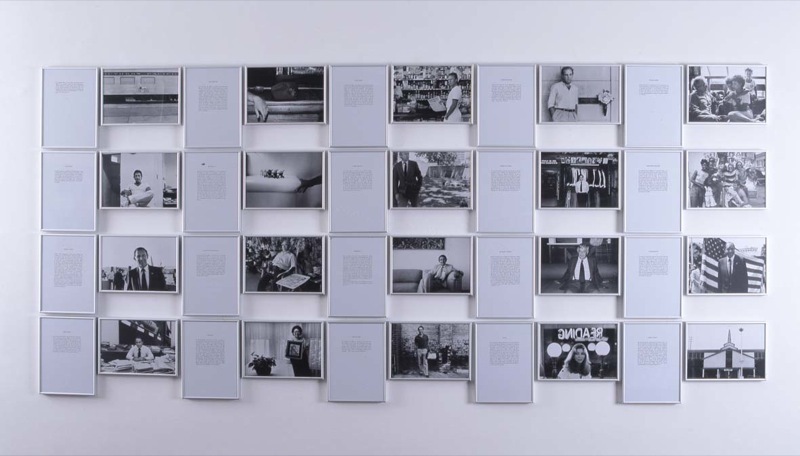 Sophie Calle, Los Angeles, 1984, text and photographs. Sophie Calle is an artist whose operations all take place at the level of the street. In 1979 Calle returned to Paris after seven years of travelling. Feeling lost and adrift in a city that was no longer her own, she decided to follow people on the street. Giving herself up to the energy and imagination of strangers was a way for Calle to re-learn the city, to be a shadow and enter the lives of others without talking to them. A conceptual artist, her work is presented in text and photographic form in gallery spaces, but it is through walking in cities that she generates the encounters with strangers that is the real project of her art. Surveillance techniques and the images produced by them are used and exhibited as an integral part of her work. Her involvement in and observing of ritualized activities is often presented through a diary form or dynamic. Using the modus operandi of conceptual art to explore issues of privacy and surveillance in the city, Calle's work is more than an objective recording of her experiences. These acts of urban stalking offer ways for Calle to make connections and explore the nature of human relations in the city. Calle enters the city through the experience of those that live within it. As with the work Los Angeles, she reveals an identity of the city that is not readily available to an outsider's perspective. It is in this way that she carries out a practice of tactics, what Michel de Certeau describes as: "a calculated action determined by the absence of a proper locus...The space of a tactic is the space of the other. Thus it must play on and with a terrain imposed on it and organized by the law of a foregn power...it is a maneauver 'within the enemy's field of vision', and within enemy territory." These tactical practices operate in two ways, first in the ways in which people make ethical responses to the social order and so humanize relations with each other, and secondly in the ways in which the weak, as marginalized majority, make use of the strong and adopts, manipulates and subverts the strategies of social order. The nature of this order is one of an unstable constantly shifting structure which is too large to escape or outwardly defy. It is at the level of the everyday that such tactical responses are possible. "The everyday sparks a distrust of the heroic and the spectacle: its oppositional and dissident connotations are foregrounded as it is deployed in a confrontation with 'the bureacracy of controlled consumption'." Thus the everyday provides both weapon and battleground with which to wage a kind of guerilla warfare against the systems of operation which compose a society made up of production and consumption. An art of the everyday is particularly useful in this struggle via it's interaction with the ordinary everday rituals. The personal element in Sophie Calle's work is one of her strengths as a practictioner of tactics of resistance. It is through an attention to her the lived experiences of others and interacting with the world on a minute personal level that she intervenes in the societal systems which constrain life in the city. Her focus on the daily rituals of living emphasize the power of "making do" in her surrounding environment rather than attempting to affect the systems that control urban strucutres and environments. The category of the everyday, exists on a vast scale and offers an alternative way to interact with the city, particularly in our era of globalization in which it is impossible to represent the identity of the social whole. Even defining this social whole becomes problematic, is it it bound by national, cultural or political limits? This problem is outlined by Nikos Papastergiadis: "the identity of the social whole can no longer be represented according to the neat and discrete boundries of the national...can art of the everyday represent the lifeworld of the whole nation? Or do we need to make smaller, more specific claims about the relationship between the particular, which is always a tactical response to a number of conflicting demands, and the whole, which is already too fragmented and complex to appear as a single unit." De Certeau outlines art as a "way of making", by which he means a way of thinking that is invested in a method of acting; one which utilizes modes of consumption.. Sophie Calle's art makes use of several of the practices outlined by de Certeau in his investigation of ways of 'making do'. Her art reconstructs our experience of urban spaces, in the utilizations of everyday rituals, the privilignig of time over space, and the re-use of memory through the "authorities" that make possible everyday practices. Place plays a central role in the daily struggles between the beaurecratic powers that dominate society and those that must live within those structures. While the control of behaviour is dependent upon the distribution of work and leisure within certain designated spaces, as in the office or the home, transversive tactics do not obey these laws as they are not defined or dentified by it. Strategies of the dominant order privilige spatial relationships: "they attempt to reduce temporal relations to spatial ones through the analytical attribution of a proper place to each particular element and through the combinatory organization of the movements specific to units or groups of units." Thus certain ways of operating become the weapon for using, manipulating and diverting such spaces. Certeau uses the analogy of a North African living in Paris who insinuates into the system imposed upon him by the construction of low income housing development or the french language a way of dwelling that is specific to his native home. He "creates for himself a space in which he can find ways of using the constraining order of the place or of the language...By an art of being inbetween, he draws unexpected results from his situation". This strategy of use is employed by Sophie Calle in her phone booth from Gotham Handbook produced in collaboration with Paul Auster. In his "Personal Instructions for SC on How to Improve Life in New York City (because she asked...)", Auster encourages Calle to turn her attention to things that are neglected, "the small barely noticeable things standing right in front of our eyes". Calle's interpretation of this instruction is to cultivate a spot. Choosing a phone booth located at the corner of Greenwich and Harrison streets, she decorates it with green paper and pictures and bouquets of flowers. She stocks it with writing pads and pencils, an ashtray, a folding chair and an issue of glamour magazine. 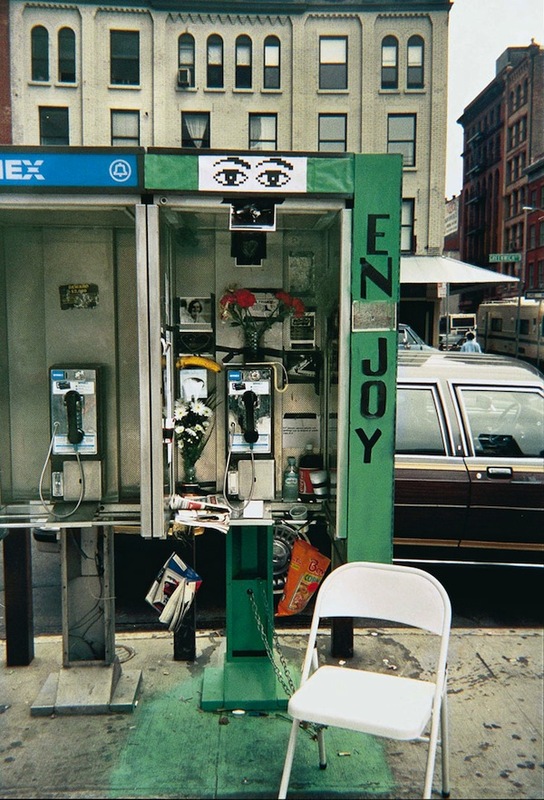 Here Calle is adopting a public space for communal use and making it personal, in filling the phone booth with things found in the home she employs the same tactic as the north african in his parisian apartment, her way of using the phone booth establishes a degree of creativity in the constraining order. In adopting an object of public service that belongs to everyone and no-one, Calle is revealing the networks of framing that exist in everyday experiences which designate certain spaces for certain tasks and to be used by certain people. Through a process of appropriation and manipulation, Calle reclaims these spaces, not by challenging them but in making them visible and in interjecting the individual into spaces designated for the multiple anonymous public. Tactics also defy the strategic privilige based on spatial relationships through a clever utilization of time, "of the opportunities it presents and also of the play that it introduces into the foundations of power. "Exquisite Pain 1984-2003 counters the defining power of space with time, in overcoming the geographic distance that lead to the end of Calle's relationship, with the measurement of the days of recovery, her unhappiness is related to the days eading up to and away from it, rather than the place in which she felt it. This is marked by her presentation of a photograph of the hotel room where she had her last conversation with her partner, and the accompanying text that tells the story of that conversation repeatedly until the artist feels she has reither told the story to death, or relativized her pain in relation to other people. The repetition of the photograph marks the spatial framing of her experience, the break up occured due to her trip to Japan, however the changing text from day to day signals the power of time as a method of exorcism. Through repeated retelling, Calle exercises control over her experience. Her photographic record of objects stamped with the number of days leading to unhappiness is also a stamp of time as the subject of her work, the objects significance is based solely on their temporal relationship to an event. Time is also the connecting element between her own experience and those of the other people who contribute to the work, in asking them the question ·when did you suffer most·, and including their written answer with a photograph of an object or place that signifies that suffering, Calle demonstrates the superiority of time over place. The photographs hold no relation to each other, it is in the common relation of a specific temporal experience that the writers in Exquisite Pain can connect, the emptiness of the photographs depicting the space in which the event occured demonstrates the insignificance of place in human experience. It is the memory and emotions that connect each photograph of a place to another, not the function of the space within the city, the image of the empty street where one person was knocked down, the apartment where a son saw his father for the last time; each of these incidents reveal a place as experienced through the pains and loves of the individual, rather that as the function for which it was built. Another way of utilizing time is through a re-use and function of the memory. In The Detachment 1996, she reveals the hidden past in urban spaces, drawing on memories of passers-by to describe the symbols of East Germany that have been removed. This is a deliberate marking of the ·presences of diverse absences· in the places in which people live. In photographing the absence and replacing the missing monuments with the spoken memories of people who walk past them everyday yet do not note the absence, she is inciting a personal re-engagement with both the urban spaces in which people live and a history which is quickly being forgotten. 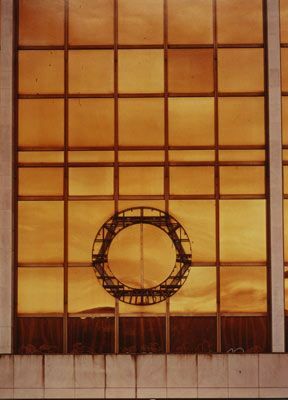 Her choice of political monuments is significant in showing the operations of the state in the construction of space, replacing official objects that the state would rather be forgotten with memories of those who daily interacted with them. This becomes a monument to the memory of a city and an acknowledgement of its temporal existence. By privileging time over space, Calle returns a power in the construction of the identity of the city to the weak, the people who walk around in it and inhabit its spaces. This tactic of engagement with the memory of the city is what Calle is expressing in the piece Los Angeles. "Places are fragmentary and inward-turning histories, pasts that others are not allowed to read, accumulated times that can be unfolded but like stories held in reserve, remaining in an enigmatic state, symbolizations encysted on the pain or pleasure of the body. 'I feel good here': the well being under expressed in the language it appears in like a fleeting glimmer is a spatial practice"
Calle's art is an art of living, in that she uses narratives from her own experiences to explore the relationship of the individual to the everyday and to others. In this way she exemplifies Henri Lefebvre's critique of everyday life, in which he states that "the art of living presupposes that the human being sees his own life- the development and intensification of his life- not as a means towards "another" end, but as an end in itself." The meaning in Calle's art is in the process, the playing out of her games and rituals, rather than in the finished product that appears on the gallery walls. She does not set out to create an object of art, but rather to seek out creativity in everyday life. When speaking about some of her first works she says "when I made them, I did not consider myself to be an artist. I was just trying to play, to avoid boredom." It is through this engagement with the everyday that the potential for artistic practice emerges: "it is in everyday life and starting from everyday life that genuine creations are achieved, those creations which produce the human and which men produce as part of the process of becoming human: works of creativity." It is the concept of everyday life that illuminates the complex ways in which subjects exercise their potential to be emancipatory and critical. Sophie Calle's art is an exploration of the systems and codes within our society that constrain everyday life. By actively engaging with those systems Calle not only exposes them but performs a tactics of assimilation, manipulation and subversion. Telling the stories of others, creating an image of a city as seen through the eyes of it's inhabitants, reconstructing the history of a place through indivdual experiences, and reclaiming those public spaces traditionally owned and controlled by the dominant in society; in each of these ways, Calle exemplifies the power of de Certeus's tactics in reconstituting the ways in which the ruban environment can be experienced. Sophie Calle, Mbas-tu vue (Munich: Prestel, 2008), 317. Certeau, The Practice of Everyday Life, 72. Papastergiadis, beverything that surrounds,b The Everyday, 72. Certeau, The Practice of Everyday Life, xv. Certeau, The Practice of Everyday Life, 30. Paul Auster and Sophie Calle, "Double Game" in The Everyday, 194. Certeau, The Practice of Everyday Life, 39. Certeau, The Practice of Everyday Life, 108. Henri Lefebvre, "The Critique of Everyday Life," in Art of the 20th Century: A Reader ed. Jason Gaiger and Paul Wood, (New Haven, London: Yale University Press, 2003), 97. Sophie Calle, quoted in Bice Curiger "In Conversation with Sophie Calle," in Sophie Calle: The Reader (London: Whitechapel, 2009), 50. Henri Lefebvre, "Clearing the Ground 1961," in The Everyday, 31. Papastergiadis, "everything that surrounds," The Everyday, 70.